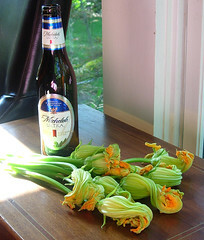 The Daily Digress: I want to help you make fried squash blossoms. I want to help you make fried squash blossoms. I want to help you do it without losing an eye. That's why I deliberately did some stupid stuff...so you would know what not to do. You're very welcome. We went to the All-Local Farmers' Market on Saturday. Among other things, I found top sirloin and New York Strip from Eubanks Farms (can't wait to compare and contrast! ), broccoli, salad galore, eggs, eggs and more eggs from Wil-More, luscious green onions, zucchini, summer squash and squash blossoms. About a year ago, one of the farmers had squash blossoms and I didn't buy them, probably because I was intimidated by the frying factor. She suggested I batter and fry them in oil. I'm terrified of hot oil. I once owned a Fry Daddy I used for the adrenaline rush. Wheeee! Anyhow, I'm more mature now and I felt ready to fry stuff, so I bought just one bunch of the blossoms. I later regretted not buying everything she had, because Oh. My. God*. Those things were so damn good. When I got home, I made my first mistake. I put them in water, because I thought it would keep them fresher. And they looked pretty. Quite possibly, you are smarter than I am and you see what's coming. First of all, they wilted. I could live with that. I did not care for what happened when I put the water saturated stems in hot oil. Damn. But I'm getting ahead of myself. For the curious, here is a closeup of the wilted squash blossoms. Since they looked a bit drunk, I took a picture of them with the beer I used in the batter. Sorry, I'm getting ahead of myself again. 8-10 shakes Slap Ya Mama Cajun Seasoning, available at Hiller Hardware, of all places. An entire Michelob Ultra I found in the fridge. I have no idea how it got there, because we don't indulge. However, in the end, i think it was the right choice. Michelob Ultra has a slight sweetness that is an unpleasant quality in a beer, but quite charming in batter. The batter should be pretty thin, but not watery. Leave it in the fridge for at least 30 minutes before using. I don't know why, but everyone else says to do it and, as I've mentioned, I'm not the sharpest knife in the block, so you should do what they say. When it comes out of the fridge, you may need to add a splash of water (or more beer) to thin it. In a big frying pan, I heated about a half-inch of grapeseed oil until it was ready. A good way to know if it's hot enough is to slide a piece of bread into the oil. If it looks like a crouton within ten seconds, it's ready. Go ahead and eat the crouton, but let it cool first. Don't test the oil with your finger. That's stupid, so stupid. I held the first blossom by its nice, long stem, quickly dragged it through the batter and slid it into the oil. Although the oil was snapping and popping and burning the sh*t out of my arm, I continued. I was on a mission, a very stupid mission I now realize. I screamed at my husband to keep the kids out of the kitchen. I wanted to die alone. There was oil everywhere. My kitchen floor is very shiny now. It dawned on me that the water contained in the stems had something to do with the huge welts that would surely develop on my arms. I'm too proud too lazy to count up the mistakes here, but let's just say that stubbornness will inspire you to make one after another in your refusal to acknowledge your own stupidity. There's a life lesson in there somewhere, but I probably won't learn it just yet. I thought of my three beautiful children (and this pocketbook that I really, really want) and knew I wasn't ready to die. For the next batch, I removed the stems. Miraculously, there was no more exploding oil as they sizzled and browned politely. When they were done, I put them on a paper towel to absorb some of the oil. A fancier person than I am might have served them in a pretty way, like, not on a paper towel, but we ate them too fast. They were meant to be appetizers for the steak and roasted vegetables I was making later for company. By the time our guests arrived, all we had left was a greasy paper towel. I didn't even bother serving the greasy paper towel. That would have been rude. I did put out some olives and nuts, though. * And I'm not taking the Lord's name in vain here, Mom. I'm actually giving Him thanks for such a perfect food. I agree, fried squash blossoms are delicious, but is it inherent or is it because anything fried tastes good? Good point. And I love me some fried anything. But there is some serious tastiness to the Squash Blossom. It tastes like squash minus the sometimes displeasing texture. Yum. They're lovely! Squash blossom tacos are traditional in parts of the Southwest...I've always wanted to try those. Now that I know about your local source, maybe I'll make some. "stubbornness will inspire you to make one after another [mistakes] in your refusal to acknowledge your own stupidity." so true. so, so frustratingly true. 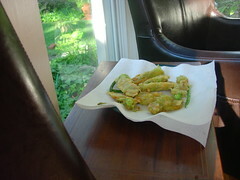 I love to cook squash blossoms. For me, they're a sign of summer. My recipe varies from yours a bit. I generally cook them with a hard cheese, fresh herbs, and save the beer for drinking -- all the better for napping that way. Just stumbled upon your blog while searching for squash blossom info. I have read many a food blog and your tone and sense of humor set you apart. I have never left a comment on a food blog, but I felt compelled to let you know you strike me as very awesome. I haven't looked at any other articles, but I'm about to. Keep up the good work!